The Washington Post had two graphics that neatly summarize the impacts from the fiscal cliff. This is the number one topic in the world of finance and almost all Americans will be impacted by the potential fallout in some fashion. My opinion is that Congressional Republicans and the Obama administration will reach some form of deal by year-end to avert falling off the so called fiscal cliff. Because if they don’t the potential consequences from the loss of consumer and business confidence could be dire to an already fragile economy. What is the Fiscal Cliff? It is basically a set of tax hikes and spending cuts that will go into effect if Congress and the re-elected Obama administration don’t compromise and get their act together. 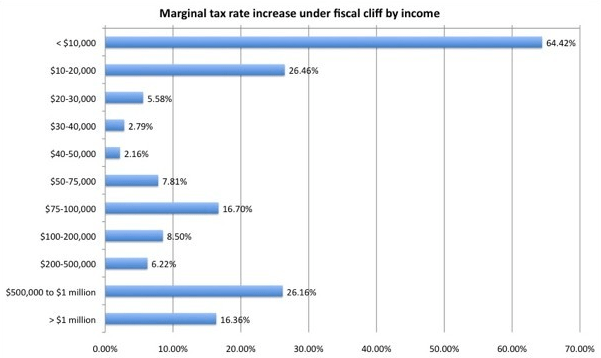 If we go over the “fiscal cliff” at the start of 2013, federal income tax rates will return to the higher pre-Bush tax cut era levels (see potential 2013 rates), the FICA payroll tax credit holiday disappears, federal long-term unemployment benefits go away and people who lose their jobs in 2013 will only be entitled to 26 weeks of state unemployment benefits. Medicare reimbursements to doctors will also get cut and because the debt ceiling stays the same the government will be forced into taking sequestration measures which means across-the-board government spending cuts, including a $55 billion (9%) cut to the defense budget. The graphic below shows how the fiscal cliff tax hikes and expiring tax breaks will impact groups based on their income levels. As expected, it will affect wealthier Americans differently (and to a larger extent) than lower-income Americans. 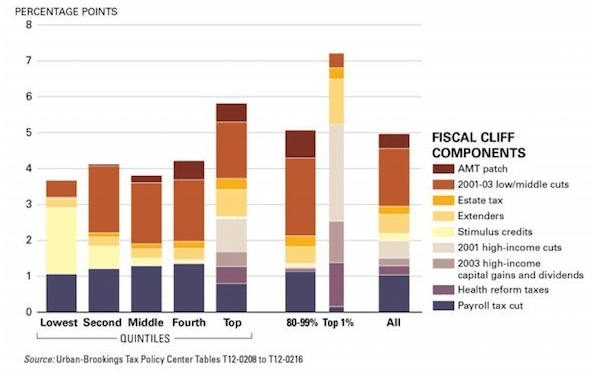 The Bush-era tax cuts, or 2001-03 low/middle income tax cuts in the graphic, are by far the largest component of the fiscal cliff. The increase in marginal tax rates in relative terms though will hit low income earners the most since America has a progressive tax system. In fact in percentage terms the lowest income earners will see a nearly 65% increase to their marginal tax rate. Fiscal Cliff: Major Market Meltdown” Expected If Congress Does Nothing. The Congressional Budget Office forecasts another recession if Congress fails to act. America’s Fiscal Cliff Can Be a Catalyst for Growth. A positive spin or potential silver lining if we do fall off the cliff. FIRE IN THE DISCO! The political realities affecting fiscal policy and the undeniable presence of the Earnings Cliff, we have all the alarm bells we should need to at least admit that the probability is greater than 50% a recession is on the horizon. •	Alternative Minimum Tax (AMT) Patch – Today the AMT usually hits taxpayers who have a household income over $75K and are married with more than two kids. However, unless the AMT is patched by the end of the year, an estimated 26 million households will face the AMT for the first time. This threatens to add an average of $3,700 to taxpayers’ bills for the current tax year. That said, historically Congress has patched the AMT every year since 1969 without fail. – Tuition and Fees Deduction: This deduction allows some college students or parents to deduct certain expenses related to schooling, including tuition, books and other supplies. TurboTax data reveals that only about 2% of our taxpayers claim this tax deduction. – Residential Energy Property Credit: This law increased the energy tax credit for homeowners who made certain energy efficient improvements to their existing homes. According to TurboTax data only an estimated 4% of our taxpayers claim this tax credit. •	Bush-Era Tax Cuts – As the name implies, the “Bush Tax Cuts” were tax cuts first passed in 2001 under George W. Bush and then extended in December 2010 by President Obama. The deductions and credits included in the Bush Tax Cuts do not impact your 2012 taxes as they won’t come into play for another year. What you could see early next year is changes to your paycheck (starting in Jan. 2013) due to changes in 2013 tax brackets.